Take a break from the race to tune up with K'Nex Roary the Racing Car Silver Hatch Garage Building Set (82017)! 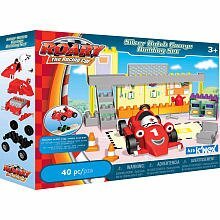 Your child can build the Silver Hatch Racetrack Garage to really experience a day in the world of Roary!The K'Nex Roary the Racing Car Silver Hatch Garage Building Set (82017) includes:40 chunky pieces for easy building fun with buildable gas pumps Removable hood on Roary's car Floor mat and other accessories for realistic and thrilling after-building play! Set also offers interactive packaging, an adapter that lets car run on popular train track systems you may already ownRoary the Racing Car follows the adventures of a young racing car who lives at the Silver Hatch racetrack. These stories explore Roary's relationships with his racing car friends and Big Chris, the karaoke loving mechanic.